In the clinical use of mindfulness, there may be a group gathering, as in one of the many mindfulness-based interventions (MBI) targeted to specific clinical populations, or a therapist and client may apply mindfulness in their work together. This positions the MBIs and other clinical uses of mindfulness as relational or, we might say, collaborative or dialogical in nature. Ironically, the extent of this relationality has been obscured by the juggernaut of a scientific evidence base that has, in effect, reified mindfulness, reduced evidence to individual outcomes and ignored or factored out the actions and effects of the teacher and group participants. Pedagogical theory and teacher training, thus, require a different discourse from that of the science as practiced. 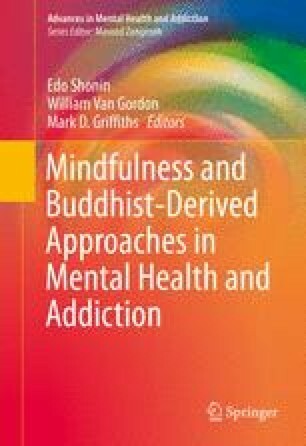 The intention of this chapter is to counteract the dominance of the individualist and positivist discourse of mindfulness, by exploring the relational dimensions that underlie the activities of teaching and learning. This chapter will define the relational situation through resources offered by interpersonal neuroscience, communications theory, cultural anthropology and social psychology. It will discuss the identity and formation of mindfulness teachers within the milieu of clinical applications, including explorations of professional qualifications, lineage and training. It will describe four basic skill sets for teaching, from stewardship of the group or dyad; to guidance of meditation and other practices; to the sharing of didactic information in conversational format, such as physiology and neurophysiology of stress and meditation; to the subtleties of inquiring into a participants’ direct experience in the present moment. Finally, it will consider how a teacher may know that what they are doing is ‘working’ and what to do when it is not. This will be characterised as an ethical stance for clinicians when using mindfulness and an aesthetics of the pedagogy. CFM. (n.d.). Mindfulness meditation retreats. http://www.umassmed.edu/cfm/training/detailed-training-information/meditation-retreats/. Accessed April 27, 2015. CFM/TDI. (n.d.). Teacher development intensive. http://www.umassmed.edu/cfm/training/detailed-training-information/teacher-development-intensive---tdi/. Accessed April 27, 2015. Kabat-Zinn, J., Santorelli, S., Blacker, M., Brantley, J., Meyer, F. M., Grossman, P., et al. (2012). Training teachers to deliver mindfulness-based stress reduction: Principles and standards. Downloaded from http://www.umassmed.edu/cfm/trainingteachers/index.aspx. Accessed January 15, 2012.